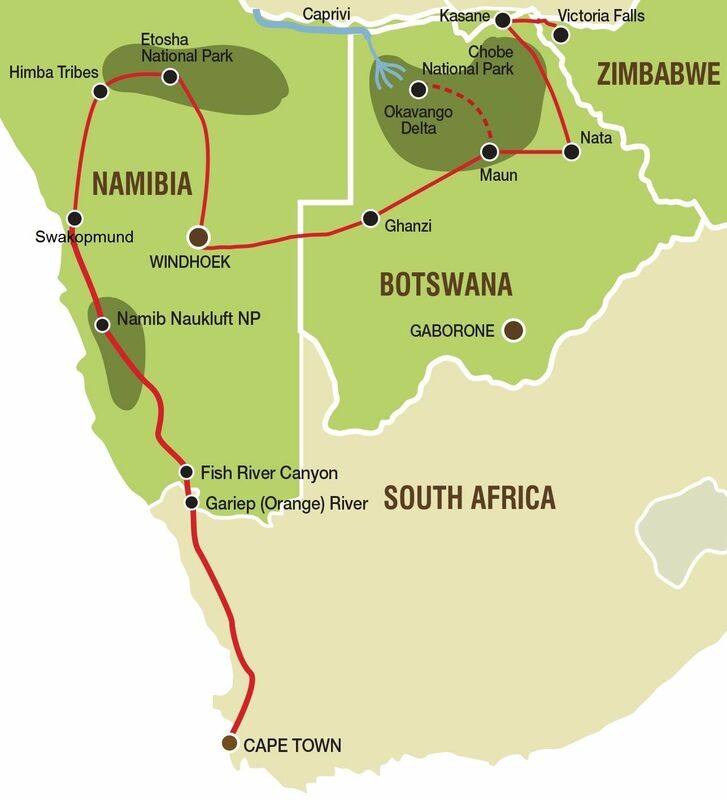 The tour from Victoria Falls to Cape Town is basically the same tours as the one from Cape Town to Victoria Falls. The only big difference is of course the direction, and on this tour, camping and hotel/ lodge clients are travelling together. Starting from one of the 7 natural wonders of the world– Victoria Falls in Zimbabwe, we head for Chobe National Park and the Okavango Delta in Botswana. We visit the Bushmen tribe before entering Namibia with its highlights- the Etosha National Park, Swakopmund, the Namib desert and many more… Finally its off the Sossusvlei and Dune 45 before we end in Cape Town - the most beautiful city in the world! Today is your arrival day in Victoria Falls and you will be able to visit the spectacular Victoria Falls at your own leisure. The Victoria Falls is one of the 7 natural wonders of the world and is worth a visit. The bustling adventure town of Victoria Falls also offers a range of optional activities for those wanting a dose of adrenaline. For the more relaxed traveller there are craft markets to explore and a delicious high tea is on offer at the Victoria Falls Hotel. Our journey today takes us across the northern reaches of the Makgadikgadi Pans and the road to Maun is lined with majestic views of the iconic Baobab tree. Upon arrival in Maun, you will have the opportunity to enjoy an optional scenic flight over the Okavango Delta (time and weather permitting – this could take place on day 6). * Note: Those guests who have pre-purchased the upgrade package – will be transferred into the Delta today and will re-join the group on the morning of day 6. View all the details here.